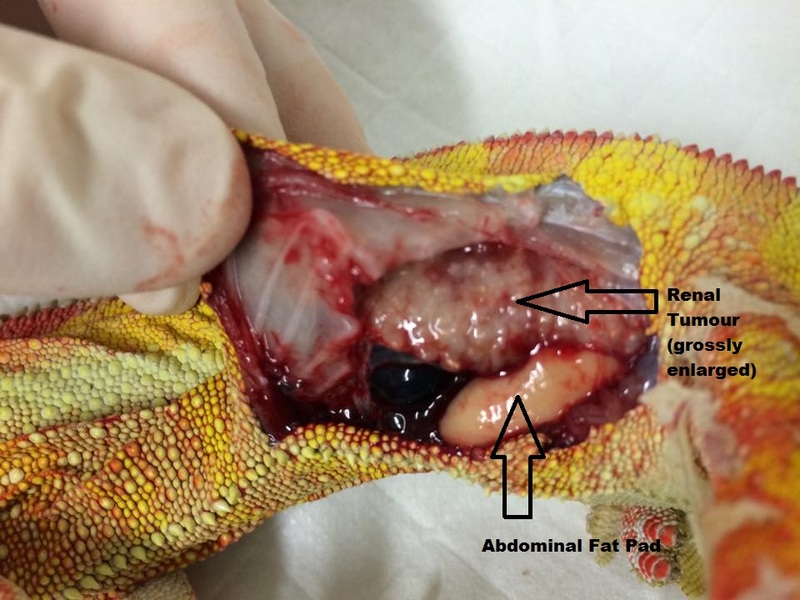 Renal Tumour in a Chameleon: A Case Study. A one year old male Panther Chameleon presented to the clinic following a one week history of progressive hind limb weakness, loss of motor function, swelling of the left knee and sleeping with his back legs dangling from his branch. He was still eating although his appetite was reduced. 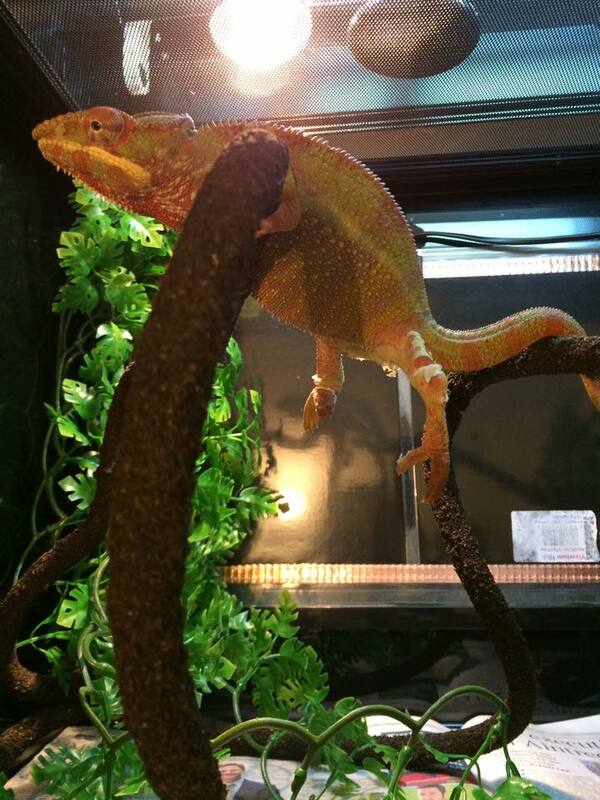 His owner was very knowledgeable and experienced in keeping reptiles, and his husbandry and captive care sounded excellent when taking a full clinical history and appraisal. There had been no changes to his routine or care, and no known history of trauma. His left knee joint however was visibly enlarged and swollen compared with the right hand side. On clinical examination, the joint was swollen but didn’t appear painful on palpation. However he was demonstrating bilateral hind limb paresis, or loss of motor function. Gripping was much reduced in the back feet compared to the front, and he appeared much weaker on the pelvic limbs also. Similarly he was reluctant to bear weight on the left hind compared with the right. Sensory function was intact and present in all limbs. This examination allowed me to form a reasonable diagnosis of a neurological problem, most likely a spinal lesion in the lumbar region or an intra-abdominal mass placing pressure therefore impinging on the nerves in this area resulting in compression and subsequent loss of motor function. 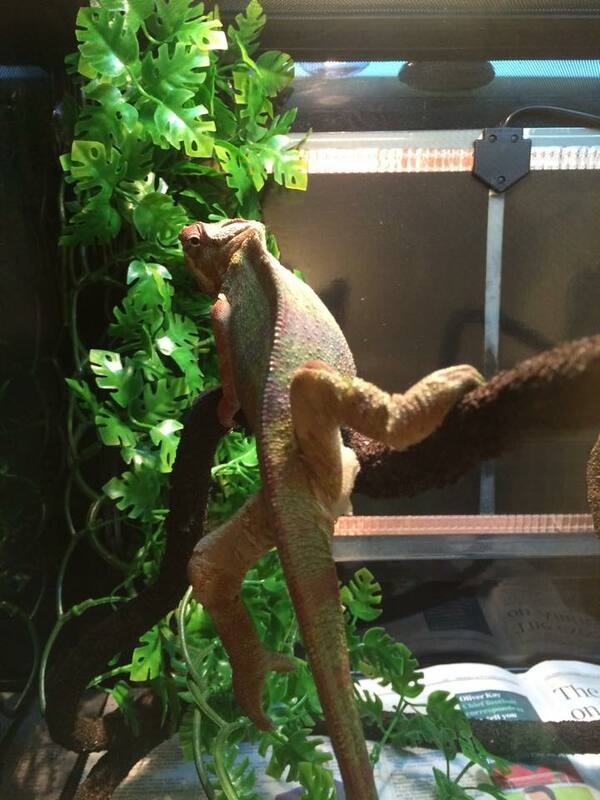 I should mention here that I had seen a photo of this chameleon on a forum I am a member of the previous day when the owner asked for advice. 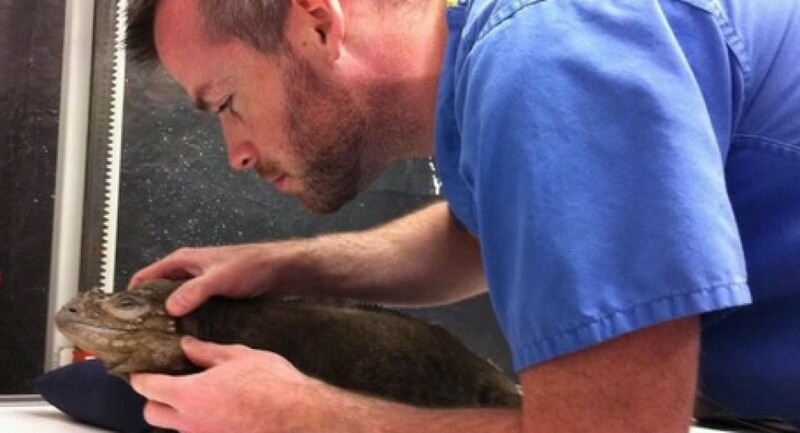 From a photo alone it would have been impossible for me to pinpoint the problem or give a reasoned diagnosis as I could when the animal was in the clinic and I could perform a full neurological examination. For this reason I would always warn owners to beware accepting an online diagnosis based on a photo alone. If in doubt, a vet visit with a reputable reptile vet is really worthwhile. I explained to the owner that based on the issues I was seeing, I suspected an abdominal mass was the worst case but highly likely scenario, so we decided an X-ray was the next step. I took a dorso-ventral view after giving the chameleon some anaesthetic gas to allow me to tape both legs in position so I could get the best image possible to compare the knee joints in the same position. The X-ray however showed a very serious and obvious problem quite apart from the swollen joint. The entire abdomen of the lizard was full of air and the internal organs were all compressed. 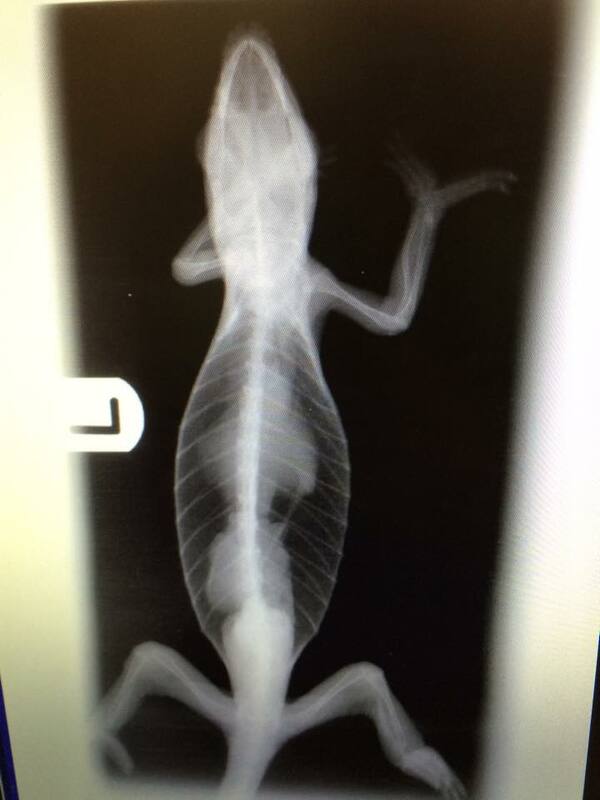 Air on an X-ray is black, and in normal chameleons the lung shadows demarcated by free gas extend a little over halfway down the length of the abdomen. Chameleons are fairly unique in that they also have finger like extensions or air sacs extending very far back towards the tail end of the body which are lined with a very thin transparent tissue almost like cling film. Therefore this is very prone to rupture from trauma, infection or damage during surgery for example. I took a lateral view to confirm the organs were compressed ventrally (towards the bottom or belly of the abdomen), which highlighted that in fact a lung or both lungs were ruptured and air had leaked into the free space within the abdomen. I was also curious to gain another view of the very dense whitish-grey mass in the caudal or tail end of the abdomen just before the pelvis, which was occupying the entire width of this section of the abdomen. Unfortunately, on the lateral view this corresponded to the site of the kidneys and confirmed my worst fear that a kidney mass of some description was responsible for the nerve impingement and neurological signs on presentation. The kidney mass may have been an abscess or a congenital problem such as hydronephrosis present from birth which was gradually causing a growth in size over time. 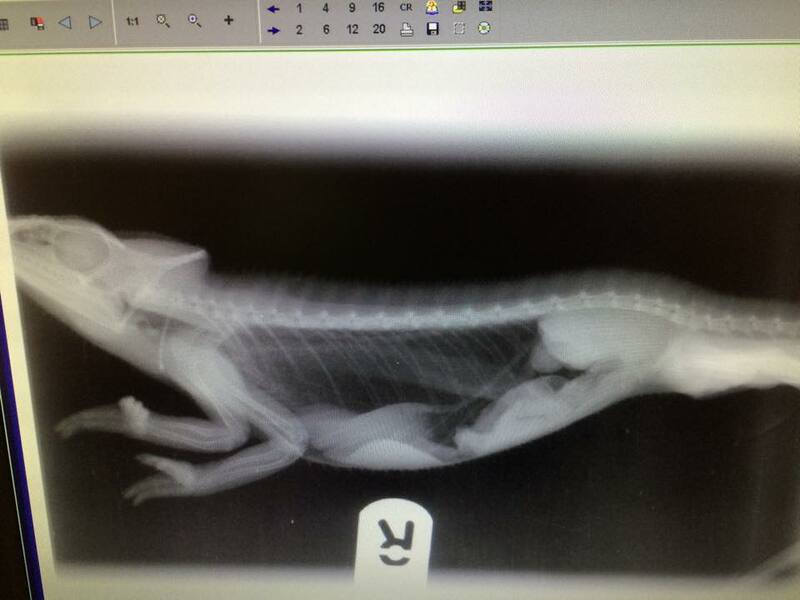 Similarly it may have been a tumour but it was difficult to tell from X-rays alone. The swelling of the joint in the left knee could have been explained by trauma associated with reduced motor function, the assumption being that he injured it in the preceding days whilst dragging it behind him. The prognosis based on a renal or kidney mass of that size no matter what the underlying cause was unfortunately quite grim, not to mention the issue of air within the abdomen causing breathing problems and compression of other vital organs. After lengthy discussion with an upset owner, it was decided that it would be fairest and most humane to put the chameleon to sleep and prevent further suffering. Any treatment or further diagnostics would have had to be very invasive and highly unlikely to bring a resolution to the problem. In order to bring a resolution to the case and for the sake of education, the owner kindly allowed me to open the abdomen following euthanasia in a post mortem examination to confirm my diagnosis of a renal or kidney mass, and ascertain the nature of the lesion. Sadly my suspicion of a renal tumour was confirmed; quite a surprising diagnosis in such a young animal you might say. However renal lymphoma, which is one of the more common cancers in reptiles, is unfortunately not exclusive to older animals as in many other cancers. Several other cancers are also reported in reptiles. In this case, the classification of the tumour would not affect the outcome of the case so I did not send any tissue samples for pathological classification. A very sad case, but the positives if any can be taken from it were that I and hopefully other veterinarians can learn from this little chameleon’s death. I’m therefore very appreciative to the owner for allowing me to write this up and share the case study. WARNING: THE FOLLOWING PICTURE IS GRAPHIC IN NATURE, SHOWING THE POST MORTEM FINDINGS. PLEASE DO NOT VIEW IF YOU ARE SQUEAMISH OR EASILY OFFENDED. I INCLUDE IT HERE FOR EDUCATIONAL PURPOSES ONLY SO THAT SIMILAR CASES MAY BE DIAGNOSED EARLIER IN FUTURE WITH THE EXPRESS PERMISSION OF THE OWNER OF THE ANIMAL IN QUESTION.